Parking Information: Please park in the lot on the corner of Grove Street and Hilliard Avenue. Parking along the stone wall is reserved for the clinic with no fee. The People’s Acupuncture of Asheville is a community acupuncture clinic committed to providing affordable acupuncture. Through this model we provide treatments so that people can get the care they need to get better and stay better. Our sliding-scale is $15-35 with a $10, first time paperwork fee. You decide what you want to pay. We do not ask for proof of income. We accept cash, check and credit card. We do not bill insurance, but will happily give you a receipt for you to mail to your insurance company. Acupuncture works best when received regularly and frequently. Our sliding scale is set to be affordable so that you can access the clinic as often as you need to maintain your health. 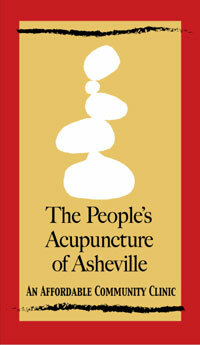 The People’s Acupuncture of Asheville is a community supported clinic. We do not receive grants, state or federal funding. When you come in for your first acupuncture treatment we will sit with you for a brief consultation. This is when you tell us what you would like to be treated for. From there you will proceed to the treatment space and get yourself ready for your treatment. We do most of our treatments with patients sitting in recliners with everyone in one room. Take your shoes and socks off and roll your pants up the knees and shirt sleeves up to the elbows. We will then come in a needle you. We invite you to stay resting with the needles in as long as you would like and you are free to leave whenever you need to. We recommend you stay at least 45 minutes. When you feel done let us know. We will remove your needles and you can leave. We ask that you remain seated during your treatment and allow yourself to relax. The group treatment setting offers a sense of communal healing and relaxation that many feel enhances the effects of their treatment. We offer eye pillows, blankets, music and ear plugs. Feel free to bring anything you need to make yourself more comfortable. We ask that you refrain from wearing overly scented products and perfumes, turn off your phones and respect our 24 hour cancellation policy. Please download our paperwork to fill out before you come in to the clinic. You may also come in 10 minutes before your treatment and fill out the forms in our waiting room. To schedule an appointment please go to http://pocapoint.com/pp/peoplesacuavl/. You may also call us at 828-254-4098 to make an appointment. Definitely leave a message if no one answers. We do accept walk-ins but prefer that you schedule online or call the clinic. Also, please note that we do not check our email for scheduling. We recommend that you wear comfortable clothes that you can easily roll up to your elbows and knees. Acupuncture can treat a variety of conditions and can even be used as a compliment to Western medicine treatments, such as chemotherapy and radiation. The World Health Organization and the National Institutes of Health have published lists of the conditions that acupuncture treats, but acupuncture is not limited to the lists of conditions compiled by the WHO or the NIH. Other Benefits – Increases Energy and Immunity, Healthy Skin, Promotes Health and Wellness, Mental & Physical Relaxation, Smoking Cessation and other Addictions.